Ms Gloria Akuffo, Attorney General (AG) and Minister for Justice, has pledged to speed up the restructuring of the Legal Aid Scheme into a Commission to make it more independent and effective. She said the Scheme has not operated effectively in the past due to its outdated structures adding that it is important to upgrade it to make it more accessible to the citizenry who may want to access its services. The Minister made the pledge in Bolgatanga in the Upper East Region during a working visit where she interacted with the staffs of the Attorney General’s Department, the Economic and Organized Crime Office (EOCO), and the Legal Aid Scheme. She said her outfit has successfully obtained approval from cabinet to upgrade the Scheme into a Commission (Legal Aid Commission Bill) and noted that when Parliament passes the Bill into an Act of Law, the Legal Aid Commission would be more attractive to engage lawyers who would be charged to offer the best of services to its clients. She said her outfit inherited a lot of debts which were being serviced from incomes that accrued to the Ministry adding that this was having a negative impact on the purse of the Ministry. The visit was aimed at reviewing and evaluating activities of personnel of the Attorney General Department to identify challenges and together find steps to address them. Ms Akuffo said once the Legal Aid Scheme becomes a Commission, it would operate on a bigger scheme, and be resourced with the requisite personnel to drive it, adding that all recruitment challenges would be addressed effectively. Responding to challenges that rose on the limited number of courts and long distance travels clients make to the Municipality to litigate in the courts, she said the District Assemblies had the responsibility to put up the needed structures, and indicated that when the structures are constructed by the Assemblies, the Judicial Service would furnish them with the needed personnel. During her interaction with the staff, she urged the personnel to do their best in the midst of the numerous challenges, prioritize the workable ones to improve the situation in the various departments as well as decouple issues that do not have financial implications and start working on them. She said there are plans to recruit about 190 personnel to feed in vacancies and strengthen other institutions under the Ministry adding that when given clearance from the Ministry of Finance, more of the challenges within the Ministry would be addressed effectively. She said visits of such nature and the continuous interaction with staff of the various institutions would help identify challenges and ensure that plans are put in place to identify reasons that account for their inability to effectively work. Mr George Kpodo, Chief State Attorney, enumerated challenges confronting the Department in the region as office accommodation, delays in staff allowances adding that the only vehicle which was more than 10 years old was draining the coffers of the office with continuous breakdowns. He said shortage of staff is hampering work, because some have retired and those vacancies were not filled and currently the region had only two lawyers managing the Department and called on the Minister to strengthen the office with at least five additional lawyers. 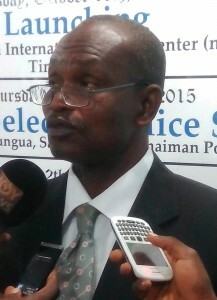 He also called for competent police investigators to the region to handle cases. Even though challenges of the EOCO and the Legal Aid Scheme were not different, shortage of lawyers to resolve cases, staff recruitment and remuneration were placed high. The AG’s team consisted Mrs Hellen Ziwu, Solicitor General, Mrs Yvonne Obuobisa, Director of Public Persecution, and Mr Suleiman Ahmed, Chief Director at the Office of the AG and the Ministry of Justice. They earlier paid courtesy call on the Regional Minister, Mr Rockson Bukari who reiterated the need for peace to prevail in the region adding that the two State Attorneys in the region were inadequate to cater for the numerous cases filed through them.